As with our last competition, the picture below shows an animal track which was photographed by Woodlore office member Steve, on a trip to East Africa. As always, the first person to correctly identify it wins a £10.00 Woodlore Voucher – good luck! It seems like this print threw a lot of you, and some of us as well! However, it was correctly identified by Jamie as the print of a baboon – well done Jamie. If you’d like to brush up on your skills at tracking and identifying wildlife, we recommend taking part in the Woodlore Tracking course, or, alternatively, taking a look at the Animal Tracks & Signs book. This entry was posted in Competitions on January 25, 2011 by Woodlore Team. well i didn’t get that, but if you stare hard enough at it, it starts to look like Wilson from the film Castaway!!! I think this track belongs to a Hyena. the track looks very crisp in the shingle, so it seems like a heavy animal, indeed that of a big cat. 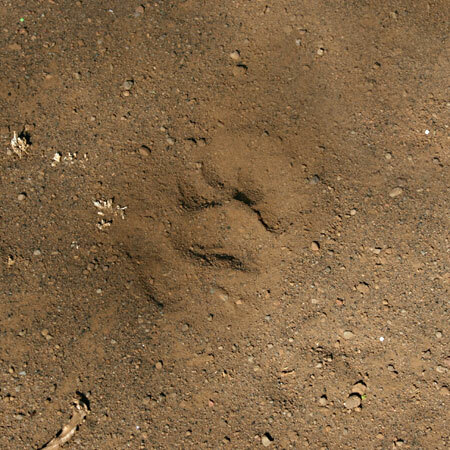 I believe this track to be the rear paw af an african lion. I will guess Cheetah. We don’t have many African cats in PEI. Is it a African Leopard? Scrap that final answer is the picture above is a Leapard track. Could it be a lion? I don’t know so I will just take a guess. An elephant? I think the track is that of an (Olive) Anubis Baboon. And if not, definitely a primate. Theres no claw marks and its a large cat print. Is it a leopard foot print.